I didn't want to do it, but the dreaded spambot has left me no choice. As if Murphy himself ordered it so, ever since I told my friend that Blogger's platform was great at blocking spam, tons of spam commenters found my site. My email was being flooded by spam comments, and though I'd come delete them, it was starting to be too much. I can't bear the thought of bringing back Captchas, that would be so cruel to you, my dear readers. I already get too few comments on the blog, I'm certainly not going to make it more complicated!!! Instead, I've been forced to instill comment moderation. Your comment will be visible after my approval. 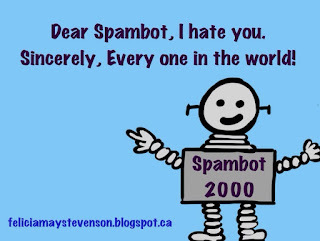 Don't blame me, blame the evil spambot. Bloody spammers. I have no idea why they do it, I don't believe for a second anyone ever clicks on their links. We are sorry if you are not comfortable with the moderation comment on my blog. BTW, I provide a special post for you about the alt-text and meta descriptions. Please visit if you have time. ahahaha! i need to do the same thing! You're right Kellie, unless its by complete accident. I've been told its because crating links back to their bogus sites helps their other sites climb page ranks. Boo. ATP, thank you so much, it is very kind of you to take the time to do so. I have visited the post and bookmarked it for future reference. I will go comment there later. Again, thank you. Yvonne, I prefer comment moderation to captchas anyday! To all: thanks for commenting!